A synchronized global economic rebound took hold in 2017, and increasing momentum into the end of the year lifted global GDP towards historical averages of a 3.5% rate of growth. Though the U.S. has now enjoyed two consecutive quarters of growth more than 3%, full year output in other developed markets has been even stronger and global trade and industrial production have continued to accelerate. Strength in both developed and emerging international markets have reduced the reliance in the U.S. on domestic consumption, and exports along with strong inventory builds have added to output in each of the first three quarters of the year. We noted in our commentary entering 2017 that following years of hibernation, the U.S. economy should benefit strongly from the staunchly pro-business policies of a Trump administration. The enthusiasm focused on the campaign agenda’s features of deregulation, corporate and individual tax reform, and infrastructure spending. While little was enacted on the legislation front before December, the impacts from aggressive deregulation were present early on. 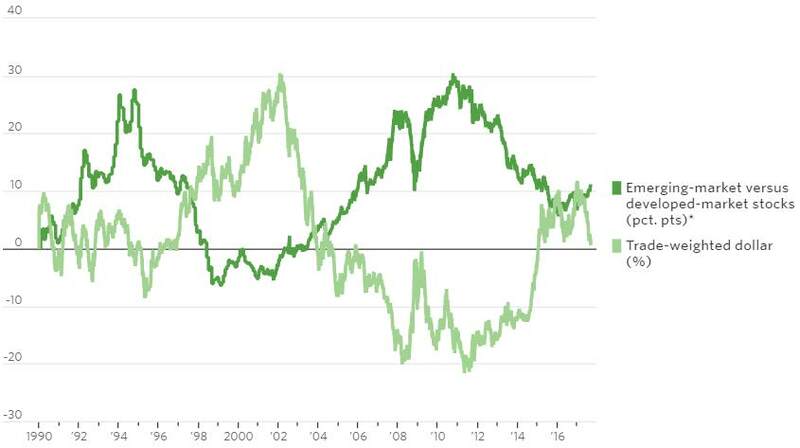 The wave of optimism that swept over corporate America was reflected in manufacturing, small business, homebuilder and even consumer sentiment indicators that soared to levels not seen in over a decade. This newfound confidence was primarily centered on the Trump administration’s focus on rolling back regulations. While this may have had less to do with the bottom line, faith was instilled in business leaders that further regulation would not be coming. Though some on Main Street may not agree, there remained a clear viewpoint in the business community that years of increasing environmental and financial oversight by the prior administrations reduced business investment and job creation. Perhaps now, animal spirits could be unleashed. Though many economists claim there is little empirical evidence that regulation curtails economic activity or that deregulation triggers it, most business leaders feel the costs of compliance diverts money and efforts that could and should be employed elsewhere. In fact, even before the passage of the major corporate tax cut into law, capital investment had grown at a 6.2% annualized rate (a/r), a welcome indicator after years of under investment. Into this backdrop of an economy entering 2018 with solid momentum, what might we now expect from the newly enacted 2017 Tax Cuts and Jobs Act? Lowering the statutory tax rate for corporations from 35% to 21% will engender immediate benefits from a permanent step-up in the level of corporate profits and will go a long way in making the U.S. an attractive destination for new businesses. Allowing the immediate expensing of capital spending should also lead to a much-needed increase in business investment. Additionally, the repatriation of overseas earnings should be beneficial to corporate shareholders. There is much to be optimistic about for the new year but how much will this benefit our economy over the longer term? Though the primary benefits may accrue to Corporate America, individual taxpayers will enjoy gains as well, many of which are front-end loaded as 62% of benefits for individuals occur in the first four years. 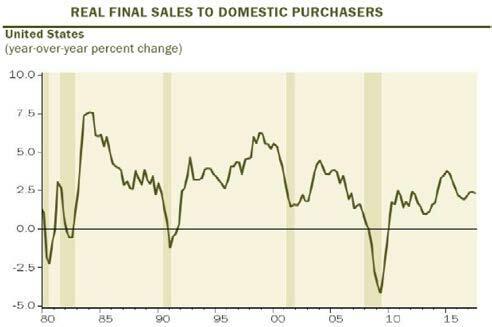 While we will discuss in the following pages the underlying fragility in the finances of the U.S. consumer (representing almost 70% of GDP), we do expect an early modest boost to consumer spending. Indeed, many economists at Wall Street firms revised up their growth forecasts for 2018, expecting the early boost in demand from increased consumption might spur more hiring. Some now see the unemployment rate dropping towards 3.5% by the end of the year from 4.1% as of December. But herein lies the rub. In 2017 for example, employment increased by 2.05MM jobs but the civilian labor force only grew 861K, thus lowering the unemployment rate from 4.7% to 4.1%. The unemployment rate last fell below 3.5% in 1952. We are late in the economic cycle, a point in time when the available labor force is near exhaustion, and this is critical for growth. Gross Domestic Product is the product of labor force increases and productivity gains. The chart below from the Wall Street Journal illustrates potential GDP output decomposed into labor force growth and growth of output per hour over the last 66 years according to research done by the Congressional Budget Office (CBO). Though productivity is always a wild card, the impact of demographics on the potential growth of the labor force is quite predictable and has decelerated from levels averaging over 1.6% annually from 1950-2001 to 0.5% currently. Over the next decade, the CBO projects labor force growth to remain around 0.5% per year. Though advancing technologies in the areas of artificial intelligence and robotics should boost the productivity side of the equation, the impact of a retiring baby-boom generation is clearly limiting labor force growth. Thus, while we feel the U.S. economy may be able to approach the recent 3% output trend in 2018, we feel it more likely to remain around 2.75% for the full year and likely to fall back towards a 2% long term trend in 2019. The skepticism that does exist towards the Tax Cuts and Jobs Act is rooted in the concern of being very late in the economic cycle. Such fiscal stimulus is viewed as much more impactful early in an economic recovery when there is pent-up demand waiting to be unleashed. Monetary policy is historically much more of a powerful influence on the economic and market cycle as it influences liquidity. Therefore, aggregate demand is much more fully bolstered when such fiscal policy is working in tandem with monetary policy not in conflict as is most likely the case currently with the Federal Reserve continuing to raise interest rates. The enthusiasm for the rebound in the U.S. economy has been palpable with Gross Domestic Product perking up after a dismal 1Q reading to generate rates of growth of 3.1% in the second quarter and 3.3% in the third. Combining that with continued strong (though moderately slowing) job growth, buoyant corporate profits and an ebullient equity market, has moved the recent data for most business and consumer sentiment indicators back towards the soaring levels of enthusiasm reached following last November’s election. Post the financial crisis, the U.S. economy averaged only a 2.1% rate of growth marking this recovery as the most tepid expansion on record. We estimate the level of output for 2017 will be just over 2.6% equaling 2015 as the strongest years of economic growth since 2006. However, we should not ignore that underneath the surface numbers, the evidence that the U.S. economy has been accelerating is thinner than the headlines shout. The last two quarters of GDP growth wasn’t actually the result of stronger domestic demand but rather the result of an increase in net foreign trade, the associated narrowing of the deficit and an increase in inventories of which the latter two are likely to prove temporary. Real final sales to domestic purchasers (how much U.S. residents are spending which excludes the impact of trade and inventories) decelerated to a 2% annual rate in 3Q down from the 2Q reading of 2.7% and the softest pace since 1Q 2016 (see chart below from Gluskin Sheff). This 2-quarter average is in line with the 2.3% pace of the prior four quarters and only slightly ahead of the 2.1% pace of the near nine-year recovery. This comports with the greater reality of a global economic lift providing a tailwind to the U.S. and is manifested in earnings increases of over 13.4% over the last year for those companies that derive greater than 50% of their sales overseas. This contrasts with those with less than 50% where earnings have only grown 2.3% . We noted in the 3Q commentary that much of the data for the second half of the year and into the early part of 2018 would be noisy and skew the data from trend following the twin hurricanes of Harvey and Irma and subsequently the California wildfires. Many have seemingly ignored the impact relating to accelerating replacement demand despite some incongruous data releases. For example, the last two employment reports showed an increase of over 50K construction workers to the affected areas while the rest of the country witnessed a contraction. Additionally, there was an abrupt reversal in the swift decline of auto sales during the last four months. These two areas alone have clearly impacted employment, autos, housing and consumer spending in a positive, but potentially illusory way. With supply chains essentially restored, there will be less demand for emergency workers and we anticipate the resumption of prior trends in many of these areas. While still expecting a solid year of growth in Gross Domestic Product, we are mindful that the fiscal stimulus may continue to overstate the actual underlying growth of the economy as replacement demand hands the baton to tax cuts. We need to see organic growth in consumer wages to maintain confidence in the continuation of the recent trend. After broaching the 2% inflation target of the Federal Reserve in 2016, core inflation has slowed since last Spring concerning Fed officials. 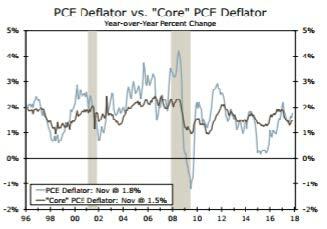 The Fed’s preferred measure of core inflation, the PCE deflator, has reached or surpassed the Fed’s 2.0% target in only five months of the current expansion, leaving many committee members worried about the persistent shortfall. While wages are slowly accelerating, inflation remains largely quiescent. The overall PCE deflator rose just 0.2% in November (chart below from Wells Fargo) and has risen only 1.8% over the last year. The core PCE deflator is exhibiting even less signs of pricing pressures increasing just 0.1% in November and 1.5% during the recent 12-month period. We do anticipate a modest increase in inflation over the early part of 2018 due to a low base effect from calendar 2017. We, therefore, expect the FOMC to maintain a gradual pace of tightening in the coming months. Whether or not this is the correct move remains a question. Inflation will be a critical issue in the new year in helping determine the answer to a question economists have pondered during the economic recovery. We have offered our thoughts in these pages in the past on the reason for the observed tepid inflation. Are we experiencing a cyclical slowdown in inflation precipitated by the financial crisis? Or is this a case of secular stagnation dictated by an aging demography and historic debt levels (and advancing technological innovation) that combine to reduce overall demand and pull down real interest rates. If inflation rises following an economy that continues to grow with a tight labor market dictating higher wages, then increases in interest rates by the Federal Reserve will be consistent with historical economic expectations. However, rising wages by themselves do not necessarily increase inflation if productivity is rising even faster as unit labor costs would then be declining. So, if inflation is truly dormant then the case for “normalizing” interest rates is weak as inflation represents little threat. The case could be made that higher real rates would give the Federal Reserve greater ammunition to combat the next downturn but it might also precipitate that downturn. We will continue to share our views on this issue as it unfolds. The US federal deficit has soared under three presidents over the last ten years, and aggregate US debt has increased by nearly $11 trillion in a decade. Despite this, interest expense on the federal budget has been flat as interest rates remained low and US debt service was refinanced at low rates. There has yet to be a price to pay. That tailwind is over. The recently enacted tax bill is estimated to add $1.5T to this deficit just as existing deficit projections and interest expense will rise. The total debt-to-GDP ratio is moving closer to 100% . In addition to more rate increases and rising interest expense, the Federal Reserve will be almost doubling the size of quantitative tightening (QT) by removing $420B of liquidity over the year (and an additional $600B in 2019) while the European Central Bank (ECB) will reduce asset purchases by $500B. This near $1T of reduced liquidity will be at a time when Jerome Powell will ascend to the position of Federal Reserve Chairman with a changing composition of the FOMC. While the transition to Mr. Powell is expected to be smooth and consistent, the board is losing two dovish voting members while adding as many as four more hawkish voters (with the balance considered moderates). A policy misstep of aggressive tightening based on an unfounded fear of inflation remains one of our biggest market and economic concerns in the new year. The job market remained more robust throughout the year than we had anticipated in our 2017 Annual Commentary with monthly job gains averaging 171K, modestly down from the 2016 average of 187K. Though these job gains pale in comparison to the 250K and 226K averages of 2014 and 2015, this slowing is expected in the latter stages of the economic cycle as we near full employment. As the 3-month gain in payrolls of 204K far exceeds the 6-month of 166K, we are circumspect that some of this solid job growth represents emergency workers hired in the wake of the natural disasters of late summer. Still, these job gains indicate that the unemployment rate may not previously have reflected the amount of slack in the job market. The U3 rate of 4.1% is the official unemployment rate that garners the headlines. However, the pool of available labor on which this metric is based excludes those individuals that may have given up looking for work in the most recent period but would take a position if offered. This group of “discouraged or marginally attached” workers (along with those working part-time that would prefer a full-time job) represent a hidden unemployment and may re-enter the labor force as jobs become more plentiful. 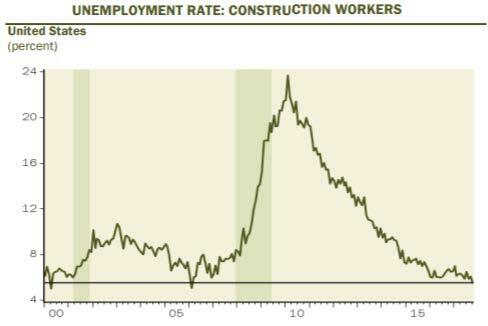 The U6 rate of employment includes these workers and over the last year has declined from 9.1% to 8.1%, or back to pre-crisis levels. Though we are in the ninth year of the economic expansion with the unemployment rate already down to a near 17-year low, we believe the economy will continue to grow above what we believe to be the long term economic potential in the new year. This should push the unemployment level down further with some economists forecasting a decline to a near 66-year low of 3.5%. Will this finally engender the much-needed wage growth? For over two years, we have anticipated that the U.S. job market might be in the nascent stages of a long-awaited return to labor gains at the expense of capital as labor markets continued to tighten. However, despite the unemployment rate now at the lowest level since 2000, wage growth on a national level has demonstrably lagged other economic indicators during the recovery. Secular impacts from an aging demography, a global labor market and advancing use of artificial intelligence and robotics will continue to exert downward pressure on wages in certain industries. Average hourly earnings for December continued to show muted wage growth rising at a 2.5%y/y pace. This measure is only one of several metrics that depict employment costs and wages (as total compensation is more than just wages). The chart below incorporates four separate measures used by economists (along with an aggregate of the four) and comports with the same view of tepid growth. Still the average for these measures is currently 3.2%y/y which is up from 2.9% at the end of 2016 and 2.2% from 2015. Wages are slowly rising. Still, we maintain that we will not see the robust wage growth long anticipated by the Federal Reserve and most economists. The impact of automation and artificial intelligence is profoundly deflationary. Moreover, an aging demographic will prove a headwind as the aging, more highly paid, baby boomers are replaced by younger, less expensive workers thus curbing growth in the aggregate hourly wage. The U.S. consumer accounts for almost 70% of our calculation of economic growth and, by extension given the weighting of the U.S. in global GDP, about 18% of total worldwide growth. To our eyes, this remains the largest area of concern for a potential slowdown in growth in 2018. In the 1960s, consumer credit (all household debt excluding mortgages and home equity loans) as a percentage of disposable income was 14%. As the baby boomer demographic settled down, this figure rose to 18% with little movement until the late 1980s when the advent of financial technology and access to easy credit allowed the consumer to bring consumption forward. 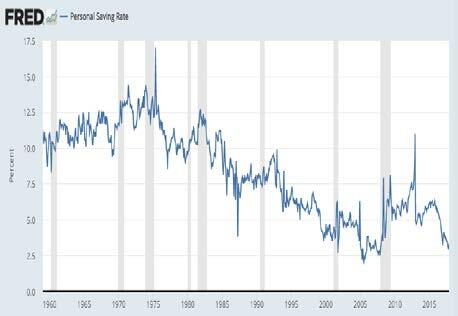 With a reduced need to spend only from current income, savings rates started a long decline from levels of more than 10% that were typical from the 1950s until the 1980s and now sits at 2.9%. During the growth era of the ‘90s, consumer credit as a percentage of household discretionary spending rose to 24% and remained there until the recession of 2007-2008. While there was a brief movement toward deleveraging, it was short-lived. 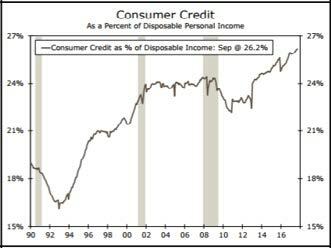 Today the ratio sits at a high of 26% (see chart below) and during the last five years consumer debt has increased at about twice the pace of household income. Personal consumption expenditures (consumer spending) adjusted for inflation downshifted considerably from the 3.8% pace experienced from 4Q 2014 through the end of 2015 to a growth rate of 2.8% in 2016 and have seemingly stabilized around 2.7% through November of this year (chart below left from Wells Fargo). This solid trend in spending is still not as buoyant as the elevated consumer confidence numbers that have been observed since the presidential election and that are at or near levels not witnessed since 2000. 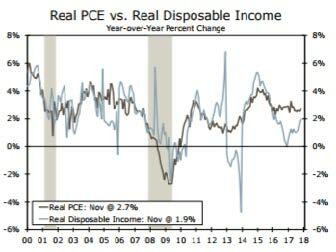 The disconnect between these data points may be found in the same chart below that shows disposable personal income adjusted for inflation to have grown only 1.9% over the same period and to have fallen way short of consumption over the last two years. Seemingly confident consumers, in an effort to maintain their standard of living in the face of slowing income growth, have significantly decreased their savings rate further while again increasing levels of borrowing. The savings rate has now declined from a level more than 6% in late 2015 to the most recent reading of 2.9% (see chart above right). These consumption habits are not sustainable. For spending to continue to grow at even the current rate, the saving rate must dramatically decline further and/or borrowing must increase. This was very apparent in the early January 2018 data release showing consumer credit expanded $28B in November, the highest monthly increase since 2001. The use of credit can often depict optimism. However, when debt is already at extreme highs and savings at lows, such an explosion of debt is very concerning for future consumption. An analysis by Gluskin Sheff shows that between 2011 and 2014 the ratio of the level of credit card debt to retail sales declined as credit card usage softened and spending was driven more by organic income growth. This was a period during which the savings rate hovered between 5%-6%. That trend has reversed since 2014 adding over $150B in total credit card debt. 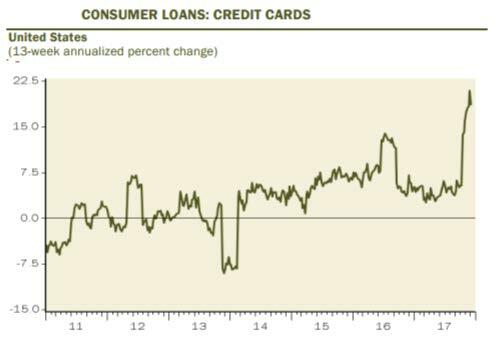 Indeed, the recent strong retail sales report for November showed an explosion of additional credit card usage (chart below left from Gluskin Sheff) alongside the aforementioned decline in the savings rate. 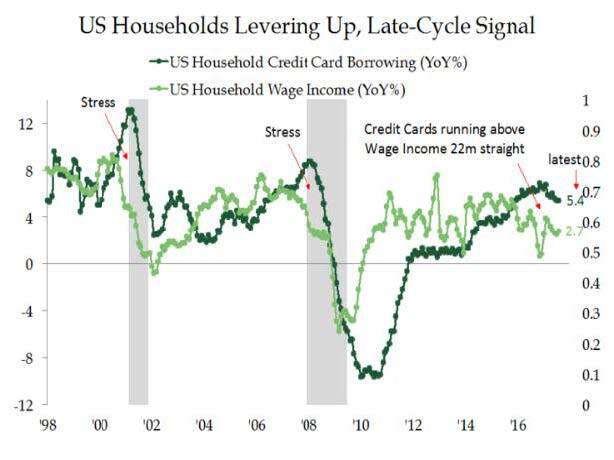 As the dark green line in the chart below right indicates, credit card borrowing has now exceeded income growth on an annual basis for two years. The vertical gray bars on the chart depict the last two recessions which are when this debt binge last occurred. Despite a strong holiday shopping season, the U.S. consumer is under increasing stress. We need to see growth in wages and salaries. We noted in our 3Q Commentary that the impact of twin hurricanes of Harvey and Irma would create a lot of noise around much of the economic data for the fourth quarter and even into the early part of 2018. Nowhere is the noise louder and the underlying trends more difficult to discern than in the housing and auto markets. The housing market appeared to end 2017 on a largely positive note. Homebuilder confidence hit the highest level since 1999 with optimism of continued income gains and low mortgage rates highlighted as boosting demand. 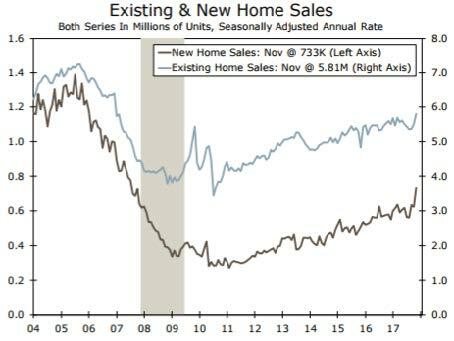 Existing and new home sales (chart below left) are up 2.1% and 9.6% respectively over the same period of 2016 through November. 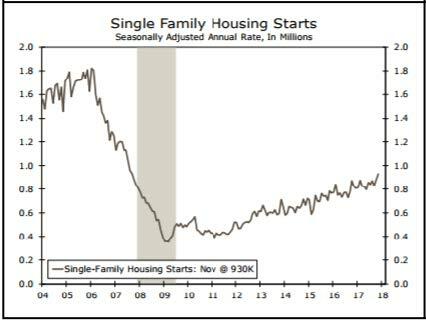 Single family housing starts are also up a strong 8.7% over the same period (chart below right). Many of the issues facing the housing market emanate less from the demand side than the supply side. The lack of buildable lots, increasing costs for municipal impact fees and raw materials (rising lumber prices due to tariffs) and a shortage of labor (chart below left) are all headwinds. 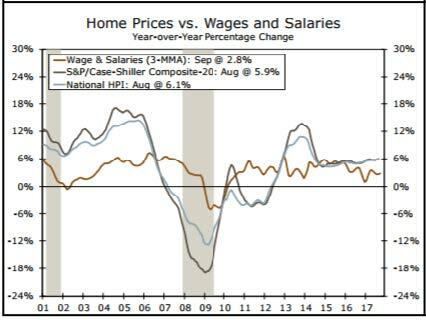 Adding in the continued concerns of affordability due to house price gains exceeding wage gains (chart below right) have left us less sanguine than most on the prospects for strong housing gains. New home sales are a small part of total home sales accounting for just over 11% of total purchases. However, we have long discussed the deferred household formation of the millennial generation and the low level of entry level buyers as holding back the normal functioning of the housing market. Entry level buyers have accounted for just over 30% of home purchases during the recovery, a level that compares with over 40% historically. On a positive note, this may be changing. Sales of newly constructed homes have increased by 8.9% in the first ten months of the year from the same period in 2016 and are up 18.7% in the most recent 12 months. Though much of the rebound clearly represents some noise from post-hurricane activity, it appears the vacuum of supply has finally drawn some builders into the marketplace and the pent-up demand from entry-level buyers is finally fueling some demand. Sales of new homes in the $200,000-$300,000 range have grown 35% in the 12-month period ending in October. Low mortgage rates along with continued solid employment growth (especially among the younger cohort) continue to aid demand for homes. We will wait for more 1Q ’18 data to better discern the impact of traditional drivers of housing demand versus the post hurricane rebuild. Nonetheless, the issues of exceedingly tight supply, rising prices and availability of construction workers remain challenges. Our 2017 view of peak auto sales certainly appeared to be correct through the first eight months of the year. However, auto sales were also clearly a beneficiary of replacement demand following the late summer hurricanes. Following a record year for light vehicle sales of 17.46MM in 2016, sales annualized at a 16.8MM a/r through August 2017, then surged to a pace approaching 18MM vehicles over the last four months (see chart below). Though this clearly benefits the readings for retail sales and consumer spending, we continue to feel this may represent noise around a declining trend that we expect to slow in the new year. As noted above, economic output has been even stronger outside of the United States in 2017. The rebound in the Eurozone continued throughout the year and Japan has now enjoyed the longest consecutive economic expansion in over 16 years. China has continued to grow solidly along with the rest of Asia. Deep recessions in Russia and Brazil have begun to reverse and a weakening dollar along with strong global demand has empowered most emerging economies. On a global scale, inflation, though still low, has started to edge up and many central banks are starting to reverse historic accommodative policy. Though central bank policy errors represent our primary concern for the new year, geopolitics may be a close second. Pax Americana is a term used to describe the relative peace among the large global economies in the period following World War II. Much of this has referenced the large economic and military position of the United States in relation to other global powers. There is a fear among many in the political sphere that the “America First” position of the Trump administration and the ensuing policies may contribute to an erosion of this global order creating a vacuum of global leadership. As Richard Haass, the President of the Council on Foreign Relations has written on the U.S. in possibly abdicating this role, “There is no other candidate…The cold truth is that the alternative to a U.S.–led international order is less international order.” If there is a decline of U.S influence, the risk of policy missteps increases. 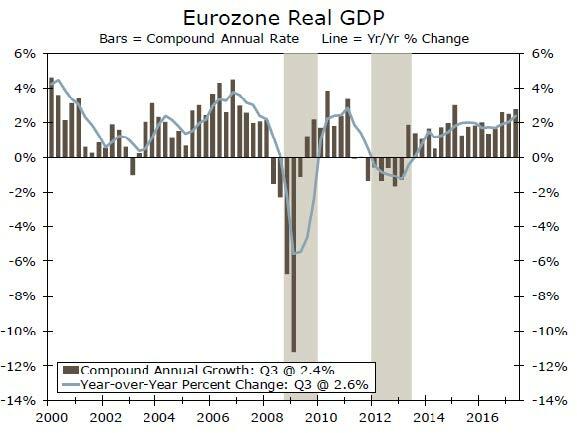 The Eurozone economy is increasingly on a self-sustaining pace with the most recent 3Q rate of growth of 2.6% y/y the fastest since 1Q 2011 (chart below left). Business investment and exports continue to lead the way but low inflation and improving employment support strength in real disposable personal income and spending. The unemployment rate in the most recent release for November shows a decline to 8.7%. This compares with a 9.6% level as we entered 2017 and is the lowest reading since January of 2009. To add greater context to what appears to be a very high rate of unemployment versus the United States, it helps to look at history. From 1995 through the end of 2017, the jobless rate in the Euro Area averaged almost 9.8% reaching an all-time high of 12.1% in April of 2013. The EZ economy has made major strides. 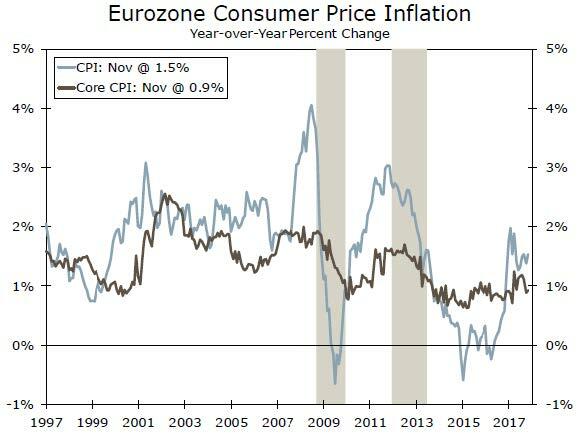 While overall output growth and unemployment data reinforce these strong economic trends, inflation (chart above right) remains stubbornly below the ECB target of 2% with the Core CPI under 1% for much of the last two years. Though low inflation does help real incomes and spending, these low readings have been the primary rationale for the continuing policy accommodation of the central bank. Despite this, the stronger economy has facilitated the reduction in monthly bond purchases from the 2017 pace of €55B to €30B to start 2018. Though we anticipate low rates to continue in Europe, the policy accommodation may end during the year if the economy maintains a pace of growth around 2.5% as we anticipate. 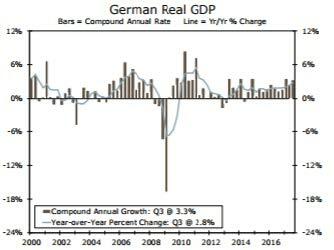 The German economy is currently strong as the year-over-year growth in GDP stands at a six-year high (chart below) and unemployment at its lowest rate in the post-reunification period (5.5% as of December). Still, Germany may be entering a period of political uncertainty that is critical for the Eurozone. Negotiations to form a new governing coalition appeared to collapse in late November which could lead to a potentially unstable minority government. If Chancellor Merkel is weakened further in needing to govern via a minority government, it would be harder to persuade other German politicians to agree to the deeper European integration proposals that French President Macron has proposed. As of late December, it did appear as if Merkel would be able to cobble together a coalition government early in the new year and that is encouraging. 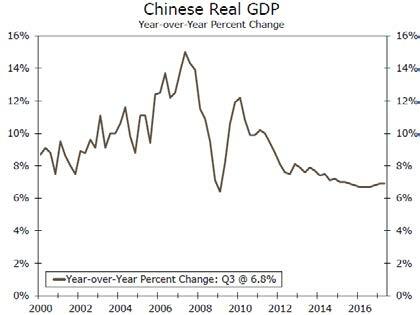 The long-anticipated slowdown in economic output has heretofore not materialized in China as the most recent reading on GDP indicates. For 3Q, China maintained the pace of the last year with a 6.8% annualized rate of growth (see chart below from Wells Fargo). High levels of non-financial debt may inhibit growth and fixed investment spending has noticeably slowed. Additionally, industrial production and export growth, that had experienced rates of growth near 20% since the global recession of 2008, have slowed since 2012. The synchronized global uplift in 2017 did reverse some of the softness in export growth which picked up through the year and along with solid consumption has been the incremental growth driver continuing the gradual shift from an investment-based economy towards greater consumption. Solidly rising wages along with rising housing prices had buoyed the consumer. However, we are seeing a stabilization in housing prices alongside a pickup in inflation with the core CPI rising firmly above 2%. This could weigh on consumer spending and we continue to look for a gradual slowing in growth in the new year towards 6%. The widely concerning challenge to the Chinese economic growth model continues to be the reliance on credit related to years of an investment-based growth model. Late in 2017, the S&P downgraded the credit rating of China from AA- to A+ citing the increased economic and financial risks created via this prolonged period of strong credit growth. Total debt in China has increased to 260% of GDP from about 175% coming out of the financial crisis. Without a reliance on foreign funding (foreign investors make up less than 2% of the domestic bond market), the risk of a major financial impact on China should remain muted. 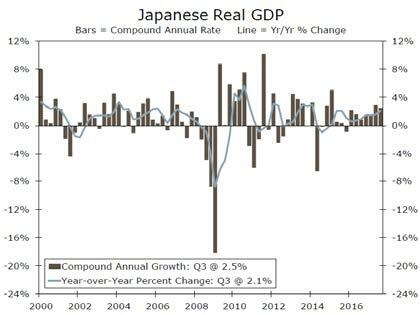 Japan continued to enjoy modest economic growth at a pace representing the fastest since 2013 as the economy expanded at a 2.5% annualized rate in the recently completed third quarter (chart on the following page below left from Wells Fargo). Although a modest deceleration from the prior quarter, this growth rate marks the seventh consecutive quarterly expansion for the Japanese economy, the longest stretch of consecutive quarterly growth in 16 years. 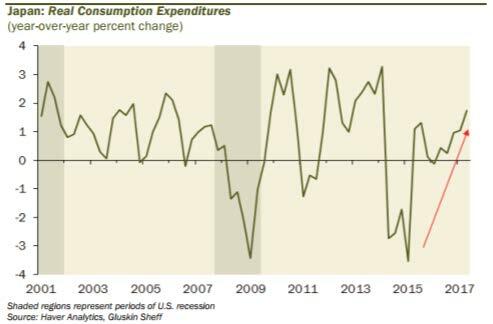 Though modestly down in the third quarter, personal consumption has contributed positively to overall growth in the most recent year and joins trade as the primary drivers of growth (chart on the following page below right). For full year 2017, we are estimating overall growth to have expanded over 1.6% and to continue at that pace into 2018. However, the newfound stability in the Japanese economy characterized by the long duration of the current expansion has led to a deepening shortage of labor with unemployment declining to 2.7%, the lowest figure since late 1994. The dependency ratio is a measure of the amount of a population below the age of 14 and above the age of 65 to the working age population between 15-64. A higher ratio illustrates the extra burden placed on working age citizens to support those outside the workforce. At 47%, Japan has the highest ratio among G20 nations and by 2050, this ratio is projected to explode to 77%. This aging demography is one of the greatest challenges to Shinzo Abe. His October landslide victory alongside his Liberal Democratic Party (LDP) assures that his ruling coalition retains its two-thirds majority in Japan’s lower house. It also makes it very likely that Abe will be selected next year to continue to head the LDP. This is critical as we have noted in the past Abe’s efforts in changing the culture by focusing on the growth of women in the labor force. 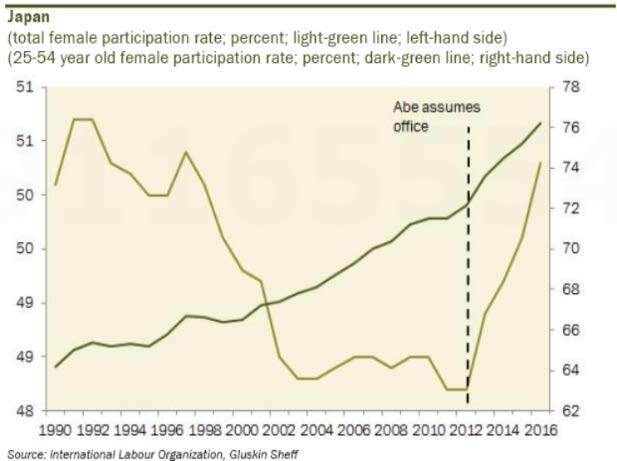 As seen in the chart below, the participation rate for female workers has risen strongly since Abe took office. This increase in the labor force has been a driving force in growing aggregate income and demand. At a near quarter century low in the unemployment rate, increasing the supply of labor is critical and focus has also turned to immigration. Long a closed society, immigration laws have been relaxed with the Japanese government loosening the rules for becoming a permanent resident of Japan. Though immigrants make up less than 2% of the total population, the group grew by 150,000 in 2016 helping counterbalance the aging demographics of the country. Emerging market economies continued to be among the largest beneficiaries of increased global demand and the softness of the U.S. dollar in 2017. The improved performance of certain large emerging economies such as Brazil and Russia combined with stabilization in economic data from China and a strengthening of previously weak commodity prices lifted the growth estimates of the International Monetary Fund (IMF) towards 4.7% for the year. This adds on to the solid 4.3% gains achieved in 2016. 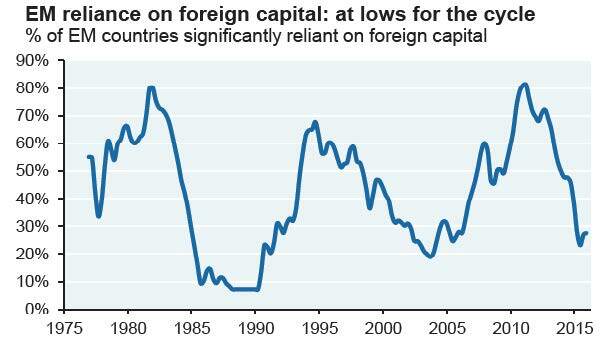 We have previously focused upon the changes in reliance on foreign capital in these markets from the period of the 1990’s when most EM economies ran large current account deficits which increased their risk of external shocks. Now, outside of Argentina and Turkey, most are balanced or run surpluses (see chart below from JP Morgan) and have far greater foreign exchange reserve levels. This enhances their flexibility to manage through shocks. The 10% decline in the U.S. dollar in 2017 moved the MSCI-EM currency index to near three-year lows thus reducing inflationary pressures towards the lowest level since the end of the financial crisis. This, in turn, has allowed central banks to lower rates and further enhance growth. Nonetheless, there remains a high correlation to the U.S. dollar due to the amount of dollar-denominated debt that still exists (a lower dollar lowers the cost to service, roll over and pay back the debt). This high correlation may represent the biggest risk to the continuation of the emerging market thesis. While markets enjoyed one of the strongest years of the last decade, the most defining characteristic for 2017 may have been the surprising calmness enjoyed by market participants. Not many among us would have predicted that the election of Donald J. Trump to President of the United States would usher in the least volatile year in history. Not only did the S&P 500 total return index set a record by rising every single month during the year (and the current winning streak of 14 months is also a record), the volatility index (VIX) enjoyed nine of the ten lowest readings in history while the S&P sported a record low annualized volatility of only 3.9%. In fact, we went virtually the entire year without so much as even a 3% correction in equity prices. Domestically, the FAANG stocks led the way to an S&P 500 total return of 21.8% (Facebook +53%, Amazon +56%, Apple +46%, Netflix +55%, and Google +33%), fueling a continued divergence between the performance of growth and value stocks. For the year The Russell 1000 Value index returned a very respectable 13.7%. Respectable, that is, unless it is compared to the Russell 1000 Growth index that generated a return of 30.2%. The MSCI EAFE index of developed international companies returned 25% with the MSCI Emerging Markets index enjoying a spectacular return of 37.3%. Surprisingly to many, there were still solid returns to be enjoyed in the fixed income markets with the Bloomberg Barclays Long Treasury index returning 8.5% and its Municipal and High Yield indices moving ahead 5.5% and 7.5% respectively. Earnings growth contributed mightily to the returns noted above in the S&P 500. Earnings growth exceeded our estimates and should end the year up more than 10% at around $131. Absent any benefit from the Tax Cuts and Jobs Act, consensus estimates (based on an economy continuing in the current growth trajectory with only modest wage and rate increases) see an increase around 6%-8% towards $140 for 2018. Analyzing the benefits to earnings of a corporate tax cut from 35% to 21% and the “deemed” repatriation (taxed irrespective of whether they are brought back to the U.S.) of approximately $2.5T of profits held overseas is more challenging given the difficulty in predicting the behavior of corporations in such a dynamic environment. Estimates range from an incremental benefit of 5% to as high as 10% including the estimated $450B of repatriated earnings that are expected to be used for additional share buybacks. This might push the total towards $150 in per share earnings for the S&P 500 index. However, there are offsets that need to be considered. According to Bank of America Merrill Lynch, the repatriation of overseas profits should result in an additional tax liability of $215B. Though allowed to be spread over eight years, it still subtracts about $3 from earnings. However, the environment will not be static. Firstly, we must appreciate the impact that the 10% decline in the U.S. dollar had on corporate earnings this past year along with strong overseas demand. Will this repeat? Additionally, there may be certain second round effects of such a reflationary environment if it materializes. Interest rate increases from the Federal Reserve and rising wage costs potentially reduce some of that benefit leading us towards a $145 estimate for S&P 500 earnings this year. With what we view as an optimistic picture of 2018 earnings, the S&P 500 is now priced at 19x earnings estimates (chart below from Factset), a level that was last seen (and breached) during the bull market of the 1990s. 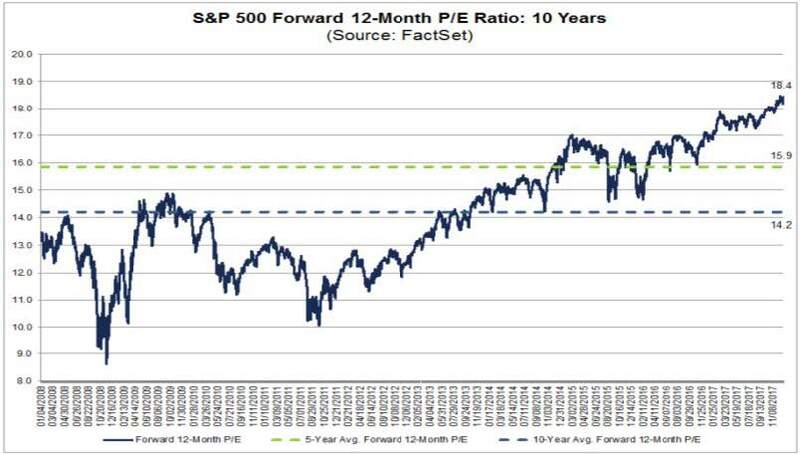 Indeed, the last three times the S&P 500 rose to or above the 19x forward earnings level was in 1929, 1936 and 1998. We noted earlier, our concern regarding policy missteps by the Federal Reserve and, though not our base case, we view this as the largest risk both to the economy and capital markets. 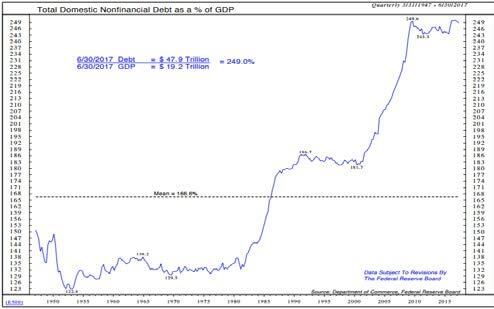 Total financial domestic debt (chart on following page from Ned Davis Research) now exceeds a record $48T or almost 250% of GDP which is back to the levels of the financial crisis. Historically a rise in interest rates consistent with an improving economy might not threaten markets. However, following eight years of expanding debt levels seduced by low rates along with equity valuations quite extended by most metrics, our financial system may be highly sensitive to smaller moves up. A 1% rise in rates would now increase interest expense by $480B or 2.5% of total GDP.With about $12T in interest-bearing cash accounts, we recognize that there would also be the positive offset under this scenario of rising interest income. However, we estimate this to be dwarfed by the impact on debt and the benefit accrues more to the wealthy thus reducing the multiplier effect. With an economy also seemingly tethered to increases in asset values, the risk expands. We are at a time when global central banks and the Federal Reserve appear intent on removing much of the policy accommodation of low interest rates that have helped support asset valuations at current levels. At Coho Partners our focus remains on downside protection. We seek to provide this from the construction of a differentiated portfolio populated with high quality companies with resilient earnings streams, growing dividends, strong balance sheets and reasonable levels of expectations and valuations. We feel this philosophy to be very well suited to address the challenges facing investors.